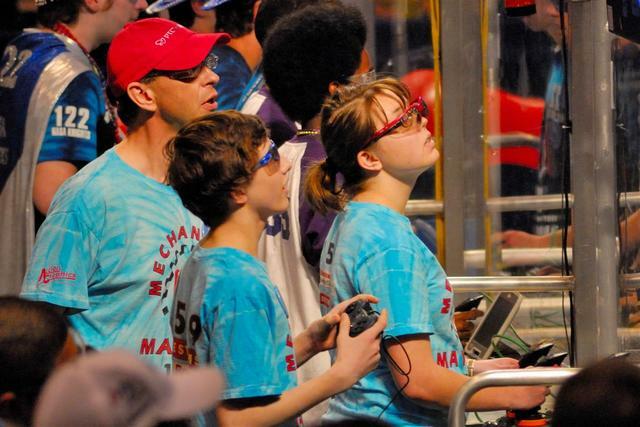 The 2011 challenge, “Logomotion,” (FRC 2011 Game Animation) provided an opportunity for students to investigate different gripper designs to grab and place tubes. 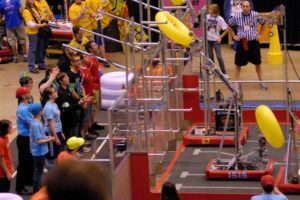 This year also posed a minibot challenge for the endgame–whoever deployed a minibot that could climb a metal pole first got bonus points. The field was divided in half with racks at each end of the field where tubes were placed to form the FIRST® logo: triangle circle square. More points were awarded for logos on the highest level. We built a robot with 2-speed 6-wheel drive base. It had an extending arm with roller claw to pick up tubes from the floor. We had multiple reliable autonomous modes to score uber tubes in multiple places. We were able to score tubes at all levels in teleop. For the endgame we had a deployment mechanism for a lightweight, quick minibot. We arrived at the Granite State Regional tournament with several adjustments to make. We had a lot of work to do with our minibots. We had built a design that attached to the pole with magnets and climbs using direct driven 1/4″ shafts. We had a lot of finishing touches to do during the first day of GSR. By the second day our drivers were well practiced and we were able to score a top row logo in many matches, sometimes with an ubertube. We also got our minibot working, and successfully launched it several times. The end of the last match was hard on the minibot, however, when it got stuck at the top of the tower and filled the arena with magic smoke. We had a wonderful end to a great tournament. We were ranked 8th at the end of qualifications, and were chosen by the 3rd seeded 175. Along with 176, we went through the eliminations undefeated. Huge thanks to Buzz and Aces High for being such great alliance partners and leading us to victory. We were honored with both the Excellence in Design Award for our robot design, and the AutoDesk Animation Award for our animation and the Website Award for our previous website! This year NASA sponsored us by paying for our registration at a new regional! Of course, much revision took place post-GSR in preparation for the upcoming Smoky Mountain Regional and Championships in Atlanta. Using the practice robot at home, our drivers became even more skilled. On Thursday morning we brought in an upgraded claw and deployment system but did not immediately install them. Later in the day we interspersed our repairs and practice matches so that we were ready for the qualification matches on Friday. We had seven matches on Friday of which we won four. We had a couple of unexpected issues that caused us to not play as well as we could have. One adjustment to our deployment system permitted too much movement of the minibot, which allowed the minibot to be out of position when we went to deploy. Fortunately we were able to have the NASA machine shop make a new part that perfectly held the minibot. During Friday’s award ceremony we were honored with the Best Website Award for the second time this year. After strategizing at length Friday night for our Saturday morning match against an undefeated team, we went on to win all three matches we had remaining. This placed us in 9th place for the alliance picking. We were chosen by the 3rd seeded team 1741, Red Alert, with whom we had partnered last year in North Carolina. 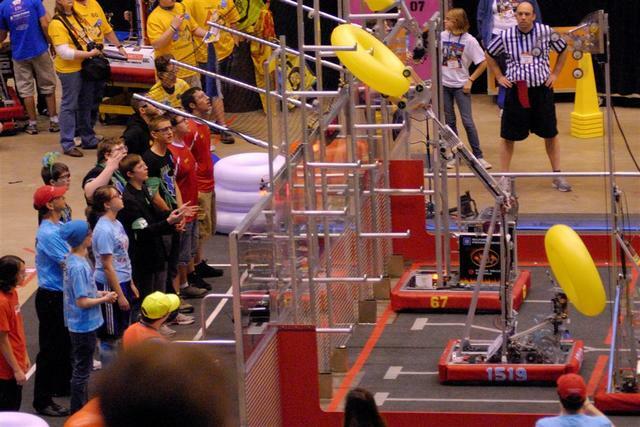 Along with 451, we faced a tough alliance of 1592, 1024, and 829. We were thrilled when the first match’s score revealed our win. However the victory was short-lived because a red card was called on our alliance for contacting an opponent’s robot in their zone. 1741, having been pushed into the zone, continued to discuss the play with the referees. After much discussion between our alliance, the refs, the other alliance, and even GDC member Aidan Browne, the play was called as the one-move-to-win as described in update 16. This resulted in a red card for our opponents, so that we won the match 1-0. The next two matches we were outscored, and lost the quarter-finals. We had a great time; however, and our own Sarah Bell was a awarded as a Dean’s List finalist! We competed at the Championship event is St. Louis in the Curie division from April 27th to 30th. We had three wins and one loss on Thursday, two wins and two losses on Friday, and one win and one loss on Saturday. 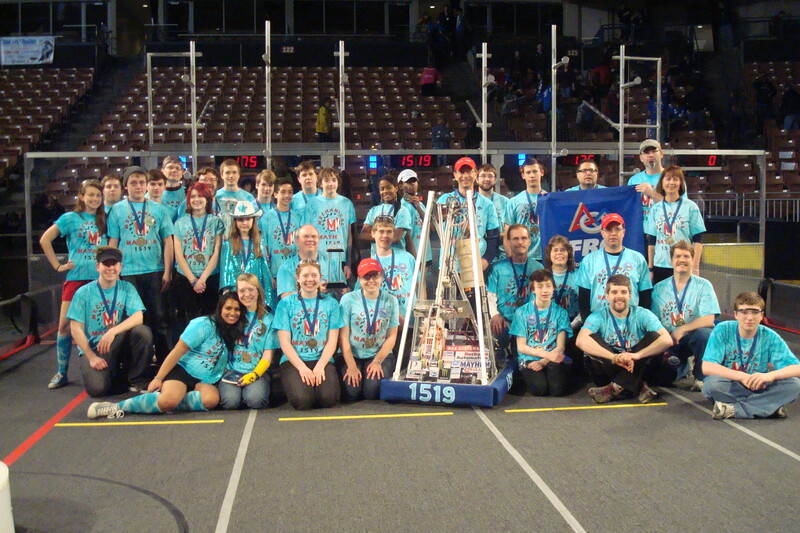 We were selected by the 6th seeded team 1983 and our alliance was subsequently joined by team 2363. Unfortunately we were eliminated in quarterfinals, but we had a great time competing and watching other teams! We also participated in various demonstrations and off season tournaments this year, including the Indiana Robotics Invitational!